A nudibranch is any of the soft-bodied, shell-less marine gastropods comprising the mollusk taxon (order or suborder) Nudibranchia. Found on the bottom of oceans throughout the world, from reefs and sandy shallows to seabeds a mile deep, there are more than 3,000 known species of nudibranchs (Holland 2008). The word "nudibranch," which comes from the Latin nudus for "naked," and the Greek brankhia for gills, describes their feathery gills and horns that many have on their dorsal sides (NGS 2008). Nudibranchs sometimes are called sea slugs, although this term technically applies to a more inclusive taxon of marine gastropod mollusks, Heterobranchia (which includes, but is not exclusive to, the nudibranchs). Nudibranchs are known for their often extraordinary colors, striking forms, and intricate patterns. Such brilliant hues and fascinating shapes have added greatly to the wonder of nature. 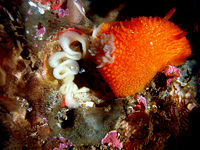 However, nudibranchs also provide important ecological functions, playing an important role in marine food chains, both as predator (corals, sponges, anemones, barnacles, fish) and prey (fish, sea spiders, turtles, sea stars)—the latter role despite protective mechanisms ranging from poisons, to camouflage, to stinging cells. Nudibranchs are members of the gastropod class (Gastropoda) of mollusks. As gastropods, their body plan involves a torsion or twisting during larval development whereby the visceral mass twists 180 degrees in relation to the head. Gastropoda (meaning "stomach-foot") is typified by a large, ventral, muscular foot for locomotion, and a distinct head that has eyes and sensory tentacles. The taxon that nudibranchs comprise, Nudibranchia, generally is placed either at the suborder level, under the order Opisthobranchia of the superorder Heterobranchia and subclass Orthogastropoda, or at the order level under the subclass Opisthobranchia (ITIS 2004). While often casually called "sea slugs," there are numerous other kinds of sea slugs belonging to several taxonomic groups that are not very closely related to nudibranchs. A fair number of these other sea slugs are colorful and thus are even more easily confused with nudibranchs. The body forms of nudibranchs vary enormously, but because they are opisthobranchs, unlike most other gastropods they are bilaterally symmetrical because they have undergone secondary detorsion. The adult form is without a shell or operculum (a bony or horny plate covering the opening of the shell, when the body is withdrawn). Often oblong in shape, some are thick and other flattened, and some are short and others long (NGS 2008). They vary in adult size from six millimeters (0.25 inches) to 31 centimeters (12 inches) in length (NGS 2008). Nudibranchs have cephalic (head) tentacles and oral tentacles, which are sensitive to touch, taste, and smell. Two club-shaped rhinophores (highly sensitive head-mounted sensory appendages or tentacles) detect odors. The name nudibranch is appropriate, since the dorids (infraclass Anthobranchia) breathe through a branchial plume of bushy extremities on their back, rather than using gills. By contrast, on the back of the aeolids in infraclass Cladobranchia, there are brightly colored sets of tentacles called cerata. Nudibranchs occur in marine environments worldwide, in all the world's oceans, and can be found depths nearly a mile down, but are most abundant, and reach their greatest size and variation, in shallow, tropical waters (NGS 2008). While they lack shells, nudibranchs have developed other defense mechanisms: poisons, stinging cells, and camouflage. Some nudibranchs have toxic secretions, mostly derived from the poisons of their prey but some have poisons of their own making (Holland 2008). For example, some species consume toxic sponges and alter and store the poisonous compounds and secrete them from skin cells or glands as needed (Holland 2008). Some utilize stinging cells, ingested from anemones, fire corals, and hydroids, and employ these along their own extremities (Holland 2008). Nudibranchs that feed on hydroids can store the hydroid's nematocysts (stinging cells) in the dorsal body wall, the cerata (Frick 2003). The nematocysts can move through the alimentary tract without harming the nudibranch. Once further into the organism, the cells are brought to specific placements on the creature's hind body via intestinal protuberances. It is not yet clear how the nudibranches can protect themselves from the hydroids and their nematocysts, but special cells with large vacuoles probably play an important role. The vivid color of various nudibranchs helps to warn predators of such defenses. Among the nudibranchs can be found the most colorful creatures on earth. The intense and bright coloring, such as especially seen on Chromodorids, warns that they are distasteful or poisonous (aposematic coloration). Camouflage also is used. The anatomy and color of nudibranchs may resemble the texture and color of the surrounding plants, sponges, and substrate, allowing them to be difficult to discern. Some may mimic toxic nudibranches. The tough-skin and abrasive quality of nudibranchs also may be a detriment (Holland 2008). Another way of protection is the release of a sour liquid from the skin. Once the specimen is physically irritated or touched by another creature, it will release the slime automatically. Nudibranchs are carnivorous, feeding on sponges, hydroids, bryozoans, coral, barnacles, eggs, tunicates, anemones, or small fish. Some eat other nudibranches, including members of their own species. Some graze on algae. Some nudibranchs derive nutrition from ingested photosynthetic algae (Holland 2008). Despite their protective mechanisms, nudibranchs have a number of predators, including certain species of fish, sea spiders, turtles, crabs, and sea stars, as well as some people (such as Chileans and islanders from off Alaska and Russia) who consume them after removing the toxic organs (Holland 2008). Nudibranchs are simultaneous hermaphroditic, and thus have a set of reproductive organs for both genders. They can rarely fertilize themselves, but can mate with any other mature members of their species (NGS 2008). Nudibranchs typically deposit their eggs within a gelatinous spiral (Klussmann-Kolb 2001). Some masses (coils, ribbons, or tangled clumbs) may reach up to two million at a time (Holland 2008). "Nudibranchia," from Ernst Haeckel's Artforms of Nature, 1904. The taxonomy of the Nudibranchia is still under investigation and is subject to frequent revision. 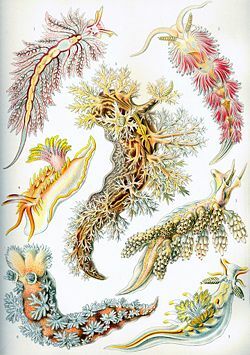 Many taxonomists in the past treated the Nudibranchia as an order, based on the authoritative work of Johannes Thiele (1931), who built on the concepts of Henri Milne-Edwards (1848). Newer insights derived from morphological data and gene-sequence research have supported the basic taxonomic divisions. On the basis of investigation of 18S rDNA sequence data, there is strong evidence for support of the monophyly of the Nudibranchia and its two major groups, the Anthobranchia/Doridoidea and Cladobranchia. 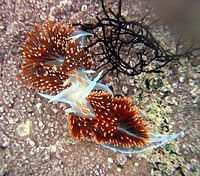 Competing taxonomies remain, with Nudibranchia variously considered an order or a suborder, and diverse classes and subclasses recognized; for example, Opisthobranchia may variously be considered an order or a subclass. Ponder and Lindberg (1997) recognize two subclasses within Gastropoda (Orthogastropoda and Eogastropoda), with Nudibranchia placed within the subclass Orthogastropoda. The Integrated Taxonomic Information System recognizes Nudibranchia as an order in the subclass Opisthobranchia (ITIS 2004). The dorids (infraorder Anthobranchia) have the following characteristics: The branchial plume forms a cluster on the posterior part of the neck, around the eyes. Fringes on the mantle do not contain any intestines. The aeolids (infraorder Cladobranchia) have the following characteristics: Instead of the branchial plume, they have cerata. They lack a mantle. Only species of the Cladobranchia are reported to house zooxanthellae. Dexiarchia nom. nov. (= Doridoxoidea + Dendronotoidea + Aeolidoidea + “Arminoidea”). Frick, K. 2003. Predator suites and flabellinid nudibranch nematocyst complements in the Gulf of Maine Proceedings of the 22nd Annual Scientific Diving Symposium, American Academy of Underwater Sciences. Greenville, North Carolina. Retrieved July 23, 2008. Holland, J. S. 2008. Living color: Toxic nudibranchs—soft, seagoing slugs—produce a brilliant defense National Geographic, June 2008. Retrieved July 23, 2008. Integrated Taxonomic Information System (ITIS). 2004. Nudibranchia Blainville, 1814 ITIS Taxonomic Serial No. : 78156. Retrieved July 23, 2008. Klussmann-Kolb, A. 2001. The reproductive systems of the Nudibranchia (Gastropoda, Opisthobranchia): Comparative histology and ultrastructure of the nidamental glands with aspects of functional morphology Zoologischer Anzeiger 240(2): 119–136. Retrieved July 23, 2008. National Geographic Society. 2008. Nudibranch (Nudibranchia) National Geographic Society. Retrieved July 23, 2008. Ponder, W. F., and D. R. Lindberg. 1997. “Towards a phylogeny of gastropod molluscs: An analysis using morphological characters.” Zoological Journal of the Linnean Society 119: 83-2651. Schrödl, M., H. Wägele, and R. C. Willan. 2001. Taxonomic redescription of the Doridoxidae(Gastropoda: Opisthobranchia), an enigmatic family of deep water nudibranchs, with discussion of basal nudibranch phylogeny Zoologischer Anzeiger 240(1): 83-97. Retrieved July 23, 2008. Wägele, H., and R. C. Willan. 2000. Phylogeny of the Nudibranchia. Zoological Journal of the Linnean Society 1(1): 83–181. This page was last modified on 26 July 2008, at 23:44.